A Development Analyst is charged with various tasks like monitoring, analyzing and enhancing the firms’ turnover or business. The other responsibilities for this job role are to the vigil, study and improve the company in its growth. For performing these job duties, a Development analyst should possess strong skills like data interpretation, conducting various surveys with clients as well as employees and make necessary recommendations thereupon. A developer analyst should be efficient enough to create financial models, communicate with the prospective clients, identify fresh business opportunities and generate pitch desks too. The Educational roadmap in the Development Analyst Resume Sample should contain a minimum graduation certificate in Computer Science or IT or Math and Science. However, career options are wide for candidates possessing technical and related certifications. Objective : 3+ years of experience as a Development Analyst, experienced, reliable, organized, detail oriented, inquisitive, challenge seeking team player and motivated self-starter seeking Consultant or Analyst positions. 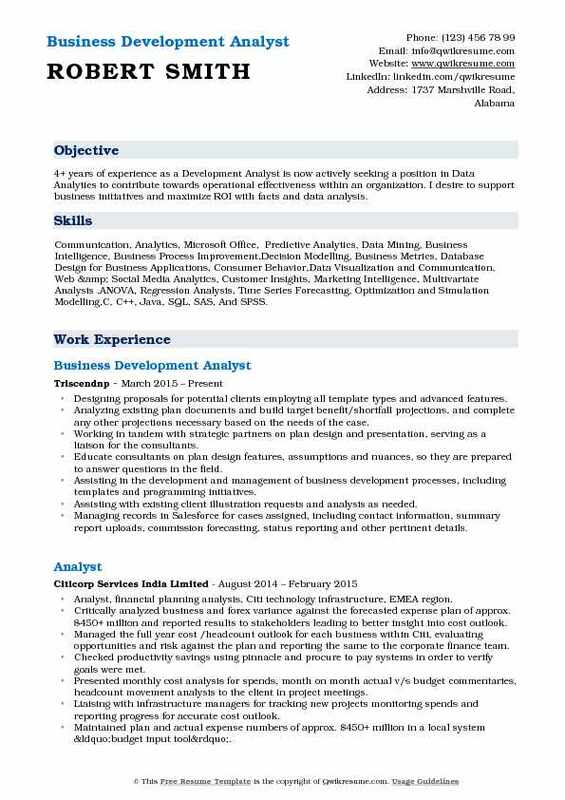 Skills : Excel, Customer Service, Banking, Management, Analytics, Auditing, And MS Office. Performing related proposal management and business development duties as assigned. Managing the process of targeting, identifying, screening and analyzing potential acquisitions utilizing several database resources. Preparing summaries of business opportunities and conducting background research in support of business development initiatives. Coordinating proposal efforts by monitoring and communicating proposal deadlines, amendment releases; performing compliance reviews prior to submission of proposals. Maintaining various reports that enable the team to track pending opportunities, and overall performance (i.e. North America weekly and biweekly pipeline report). Preparing and maintaining meeting documents for case /staffing review and pipeline review meetings on a monthly basis. Tracking sector business performance metrics, such as win/ loss rates. Research, identify and track potential business opportunities in the public sector through various online bid boards, market research tools, and web subscriptions. Compiled and reported opportunity pipeline and other bid proposal data to BCG leadership using spreadsheet and database tools. Analyze solicitations, sources-sought notices, requests for information (RFI), and requests for proposals/quotes (RFPS/RFQS). Preparing summaries of business opportunities and presented to BCG senior leadership for further review. 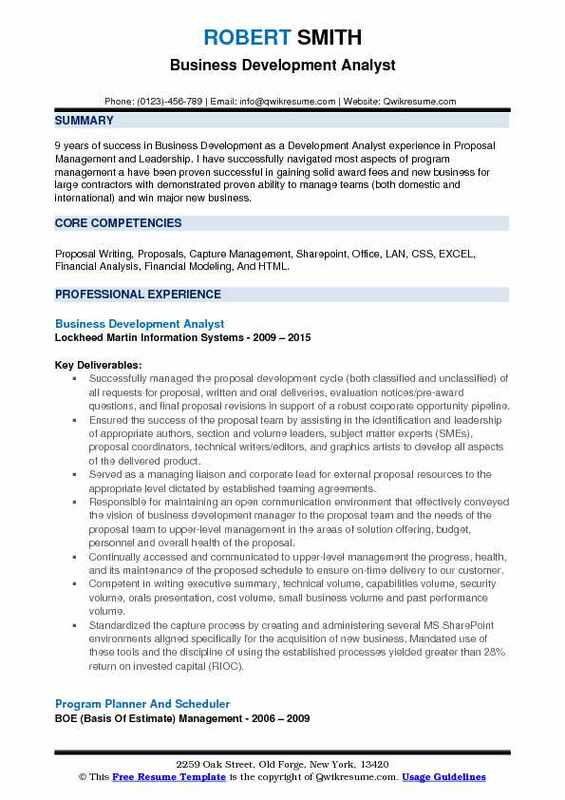 Summary : 9 years of success in Business Development as a Development Analyst experience in Proposal Management and Leadership. I have successfully navigated most aspects of program management a have been proven successful in gaining solid award fees and new business for large contractors with demonstrated proven ability to manage teams (both domestic and international) and win major new business. Skills : Proposal Writing, Proposals, Capture Management, Sharepoint, Office, LAN, CSS, EXCEL, Financial Analysis, Financial Modeling, And HTML. Successfully managed the proposal development cycle (both classified and unclassified) of all requests for proposal, written and oral deliveries, evaluation notices/pre-award questions, and final proposal revisions in support of a robust corporate opportunity pipeline. Ensured the success of the proposal team by assisting in the identification and leadership of appropriate authors, section and volume leaders, subject matter experts (SMEs), proposal coordinators, technical writers/editors, and graphics artists to develop all aspects of the delivered product. Served as a managing liaison and corporate lead for external proposal resources to the appropriate level dictated by established teaming agreements. 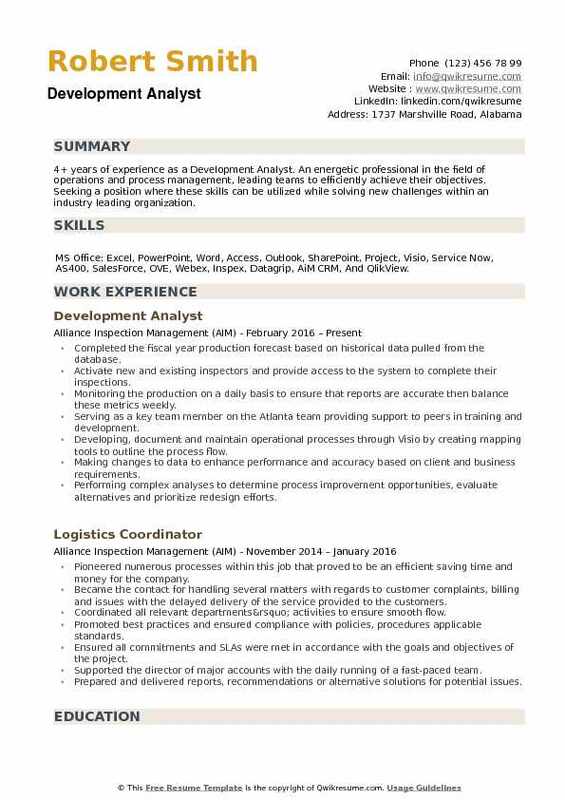 Responsible for maintaining an open communication environment that effectively conveyed the vision of business development manager to the proposal team and the needs of the proposal team to upper-level management in the areas of solution offering, budget, personnel and overall health of the proposal. Continually accessed and communicated to upper-level management the progress, health, and its maintenance of the proposed schedule to ensure on-time delivery to our customer. Competent in writing executive summary, technical volume, capabilities volume, security volume, orals presentation, cost volume, small business volume and past performance volume. Standardized the capture process by creating and administering several MS SharePoint environments aligned specifically for the acquisition of new business. Mandated use of these tools and the discipline of using the established processes yielded greater than 28% return on invested capital (RIOC). Developed and implemented a full business process model training for the consistent capture activities by all proposal and capture management personnel. Summary : 10 years of experience as a Development Analyst is looking forward to expanding as an innovative and creative business professional in the Business Development field. Add value to a successful organization in a challenging position which allows me to effectively utilize my skill sets and knowledge for professional growth. 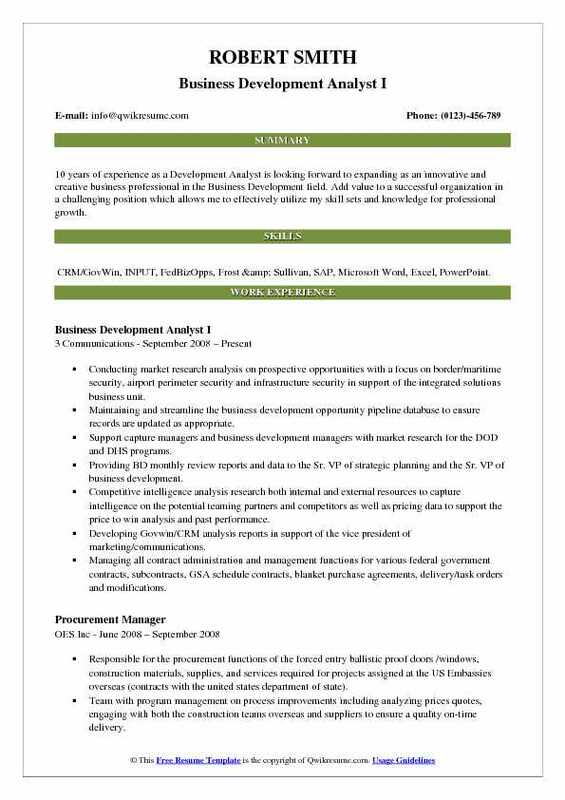 Skills : CRM/GovWin, INPUT, FedBizOpps, Frost & Sullivan, SAP, Microsoft Word, Excel, PowerPoint. Conducting market research analysis on prospective opportunities with a focus on border/maritime security, airport perimeter security and infrastructure security in support of the integrated solutions business unit. Maintaining and streamline the business development opportunity pipeline database to ensure records are updated as appropriate. Support capture managers and business development managers with market research for the DOD and DHS programs. Providing BD monthly review reports and data to the Sr. VP of strategic planning and the Sr. VP of business development. Competitive intelligence analysis: research both internal and external resources to capture intelligence on the potential teaming partners and competitors as well as pricing data to support the price to win analysis and past performance. Developing Govwin/CRM analysis reports in support of the vice president of marketing/communications. Managing all contract administration and management functions for various federal government contracts, subcontracts, GSA schedule contracts, blanket purchase agreements, delivery/task orders and modifications. Responsible for cost proposals; review and negotiation of non-disclosure agreements, and teaming agreements. Assisting business unit Vice President, Program Managers, Business Development Managers, and Project Managers in resolving contractual problems as may be required. 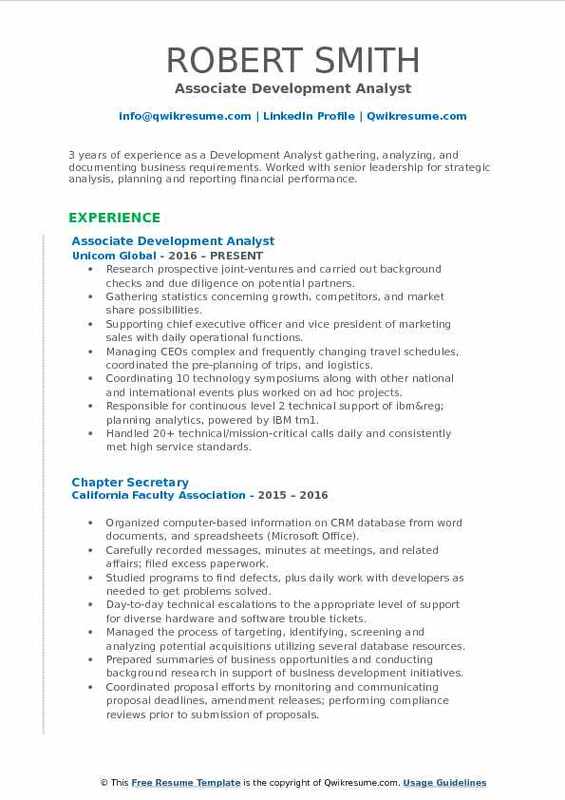 Objective : 3 years of experience as a Development Analyst gathering, analyzing, and documenting business requirements. Worked with senior leadership for strategic analysis, planning and reporting financial performance. Skills : Sales, Marketing, Business Development, Technical Support, Event Planning, Finance, And Relationship Management. Research prospective joint-ventures and carried out background checks and due diligence on potential partners. Gathering statistics concerning growth, competitors, and market share possibilities. Supporting chief executive officer and vice president of marketing sales with daily operational functions. Managing CEO's complex and frequently changing travel schedules, coordinated the pre-planning of trips, and logistics. Coordinating 10 technology symposiums along with other national and international events plus worked on ad hoc projects. Responsible for continuous level 2 technical support of ibm® planning analytics, powered by IBM tm1. Handled 20+ technical/mission-critical calls daily and consistently met high service standards. Operating a single, managed call center providing single-point-of-contact for all inquiries (macro 4: TechNet portal). Platforms used: Windows, UNIX, Linux, Mac OS X, ios, Android, CICS/Mainframe. Aided legal department in drafting and revising legal documents such as product license agreements. 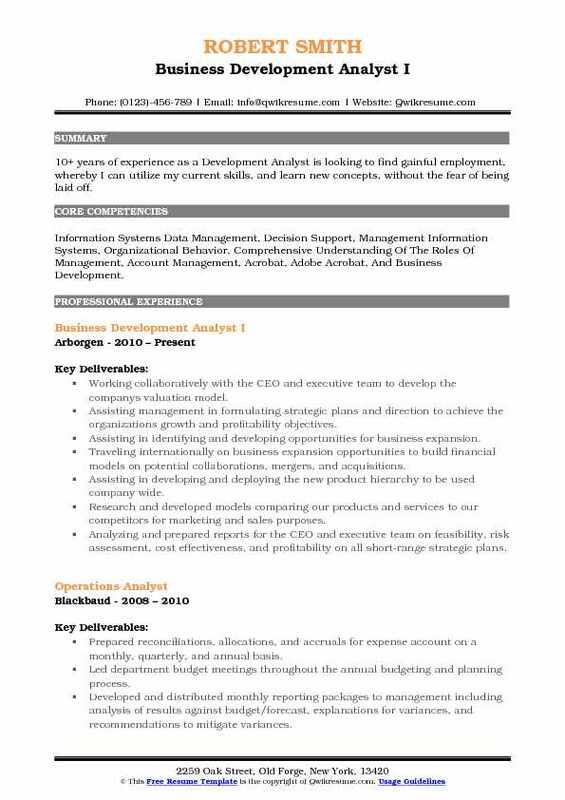 Objective : 4+ years of experience as a Development Analyst is seeking to obtain a position where I can utilize and develop my analytical skills, knowledge of business administration, business planning, managerial accounting and financial analysis; in particular, to apply said knowledge to help businesses improve their performance. Skills : Data Analysis, Excel, Marketing Analysis, Microsoft Word, Office, CSS, EXCEL, Stata Language: Mandarin, Chinese (Native), English (Fluent) GMAT Score: 710/800, Financial Analysis, Financial Modeling, And HTML. Identified potential business opportunities across different states in the US By undertaking frequent and thorough market. Research and analysis on energy policies, government regulations and incentive programs across various states in the US to build a solid foundation for the business development team in the future lead generation process. Redesigned and improved the existing financial model and analyzed potential business opportunities in targeted states by adding. The src variable to better reflect the return on financiers and by producing the US Electricity rate and trend analysis report. On selected states to provide accurate information for customers and financiers to visualize the trend of electricity rate, the possibility of getting an increase in the electricity rate and the opportunity in community distributed generation (CDG) in. Revenue, EBITDA, gross margin, EBITDA margin, profit margin, LTM multiples such as TEV/r and TEV/EBITDA and leverage such as debt/capital, debt/EBITDA and EBIT coverage of comparable companies listed on TSX, NYSE and Nasdaq to. Help the board and potential investors to better visualize the financial position of UGE international among other comparable. Produced the white paper about power purchase agreement (PPA) to customers with detailed analysis on pros and cons for PPA. Objective : 4+ years of experience as a Development Analyst is now actively seeking a position in Data Analytics to contribute towards operational effectiveness within an organization. I desire to support business initiatives and maximize ROI with facts and data analysis. Skills : Communication, Analytics, Microsoft Office, Predictive Analytics, Data Mining, Business Intelligence, Business Process Improvement,Decision Modelling, Business Metrics, Database Design for Business Applications, Consumer Behavior,Data Visualization and Communication, Web & Social Media Analytics, Customer Insights, Marketing Intelligence, Multivariate Analysis ,ANOVA, Regression Analysis, Time Series Forecasting, Optimization and Simulation Modelling,C, C++, Java, SQL, SAS, And SPSS. Designing proposals for potential clients employing all template types and advanced features. Analyzing existing plan documents and build target benefit/shortfall projections, and complete any other projections necessary based on the needs of the case. Working in tandem with strategic partners on plan design and presentation, serving as a liaison for the consultants. Educate consultants on plan design features, assumptions and nuances, so they are prepared to answer questions in the field. Assisting in the development and management of business development processes, including templates and programming initiatives. Assisting with existing client illustration requests and analysis as needed. Managing records in Salesforce for cases assigned, including contact information, summary report uploads, commission forecasting, status reporting and other pertinent details. Assisting in new product testing and analysis for viability and to determine best practices. Participating in industry-specific research for evaluating new business lines. Developing tools and programs for managing custom analyses and new designs. Developing an understanding of split-dollar accounting and become an internal and external resource in this area. Lead analytical briefings for business development department, field consultants, and strategic partners. 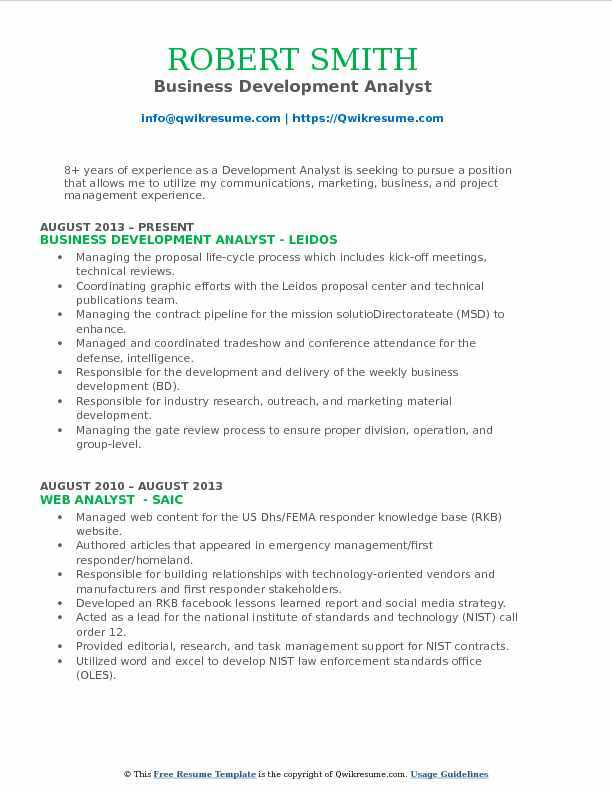 Summary : 8+ years of experience as a Development Analyst is seeking to pursue a position that allows me to utilize my communications, marketing, business, and project management experience. 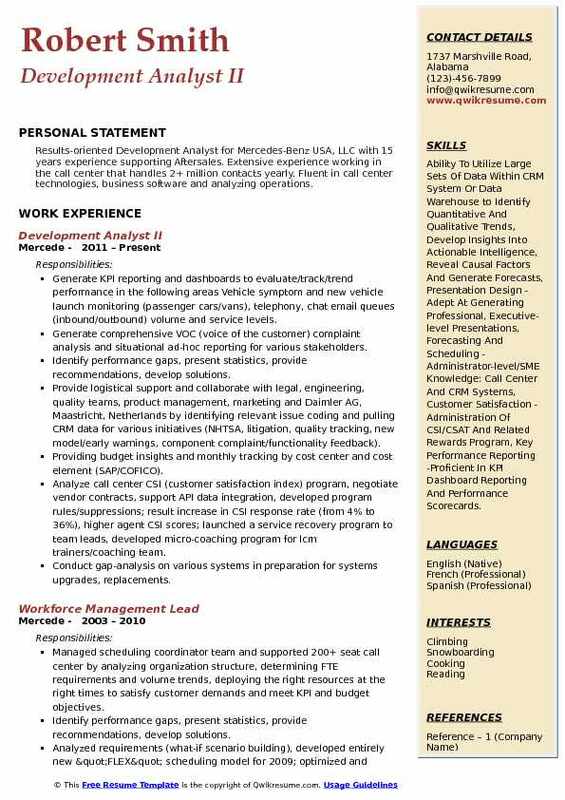 Skills : Microsoft Word, PowerPoint, SharePoint, Project, Excel, Adobe Products, Fusion, Oracle, CRM, CSS, Financial Analysis, Financial Modeling, And HTML. Managing the proposal life-cycle process which includes kick-off meetings, technical reviews. Coordinating graphic efforts with the Leidos proposal center and technical publications team. Managing the contract pipeline for the mission solutioDirectorateate (MSD) to enhance. Managed and coordinated tradeshow and conference attendance for the defense, intelligence. Responsible for the development and delivery of the weekly business development (BD). Responsible for industry research, outreach, and marketing material development. Managing the gate review process to ensure proper division, operation, and group-level. Schedule and participated in standard guidance (SG) processes and approvals. Identified new opportunities to pursue via gov win, Fedbiz ops, and the defense aerospace competitive intelligence service (DACIS). Utilizing Oracle customer relationship management (CRM) on demand to track business. Assisting executive management with community relations and outreach, and respective. Working with Leidos contracts department and contracting system to verify marketing data. 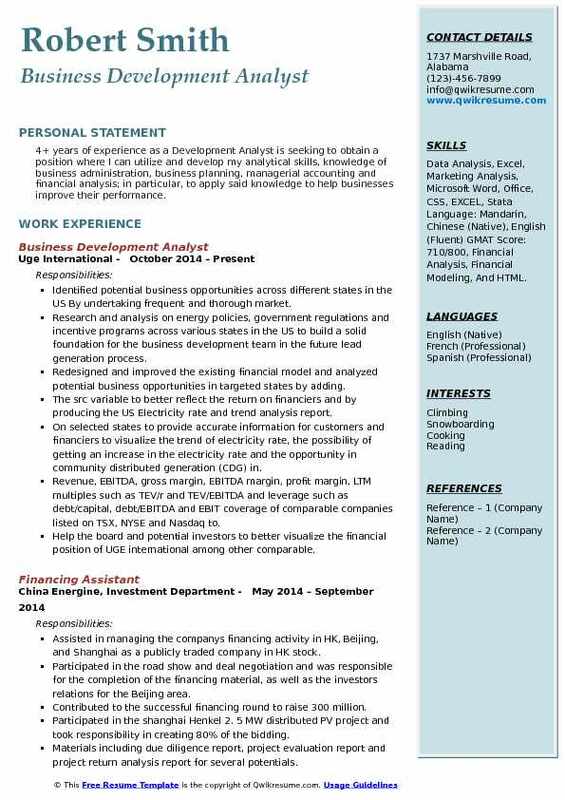 Summary : 10+ years of experience as a Development Analyst is looking to find gainful employment, whereby I can utilize my current skills, and learn new concepts, without the fear of being laid off. Skills : Information Systems Data Management, Decision Support, Management Information Systems, Organizational Behavior, Comprehensive Understanding Of The Roles Of Management, Account Management, Acrobat, Adobe Acrobat, And Business Development. Working collaboratively with the CEO and executive team to develop the company's valuation model. Assisting management in formulating strategic plans and direction to achieve the organizations' growth and profitability objectives. Assisting in identifying and developing opportunities for business expansion. Traveling internationally on business expansion opportunities to build financial models on potential collaborations, mergers, and acquisitions. Assisting in developing and deploying the new product hierarchy to be used company wide. Research and developed models comparing our products and services to our competitors for marketing and sales purposes. Analyzing and prepared reports for the CEO and executive team on feasibility, risk assessment, cost effectiveness, and profitability on all short-range strategic plans. Organized and led teams on potential collaboration efforts outlining the broad guidelines, researching the costs, and deciding if the projects were viable to continue. Reviewing financial statements, sales, and activity report to build the new corporate objectives. Analyzing and determine the level of risk for the pipeline of products. Built several business models to analyze information and evaluate future business decisions. Organized and analyzed data from all sources, using statistical methods to ensure the validity of results. Summary : Results-oriented Development Analyst for Mercedes-Benz USA, LLC with 15 years experience supporting Aftersales. Extensive experience working in the call center that handles 2+ million contacts yearly. Fluent in call center technologies, business software and analyzing operations. Skills : Ability To Utilize Large Sets Of Data Within CRM System Or Data Warehouse to Identify Quantitative And Qualitative Trends, Develop Insights Into Actionable Intelligence, Reveal Causal Factors And Generate Forecasts, Presentation Design - Adept At Generating Professional, Executive-level Presentations, Forecasting And Scheduling - Administrator-level/SME Knowledge: Call Center And CRM Systems, Customer Satisfaction - Administration Of CSI/CSAT And Related Rewards Program, Key Performance Reporting -Proficient In KPI Dashboard Reporting And Performance Scorecards. Generate KPI reporting and dashboards to evaluate/track/trend performance in the following areas: Vehicle symptom and new vehicle launch monitoring (passenger cars/vans), telephony, chat email queues (inbound/outbound) volume and service levels. Generate comprehensive VOC (voice of the customer) complaint analysis and situational ad-hoc reporting for various stakeholders. Identify performance gaps, present statistics, provide recommendations, develop solutions. Provide logistical support and collaborate with legal, engineering, quality teams, product management, marketing and Daimler AG, Maastricht, Netherlands by identifying relevant issue coding and pulling CRM data for various initiatives (NHTSA, litigation, quality tracking, new model/early warnings, component complaint/functionality feedback). Providing budget insights and monthly tracking by cost center and cost element (SAP/COFICO). Analyze call center CSI (customer satisfaction index) program, negotiate vendor contracts, support API data integration, developed program rules/suppressions; result: increase in CSI response rate (from 4% to 36%), higher agent CSI scores; launched a service recovery program to team leads, developed micro-coaching program for lcm trainers/coaching team. Conduct gap-analysis on various systems in preparation for systems upgrades, replacements. Support cross-functional teams from Daimler/Maastricht in systems gap analysis and developing replacement call center technology packages for the NAFTA markets to be launched in 2018. 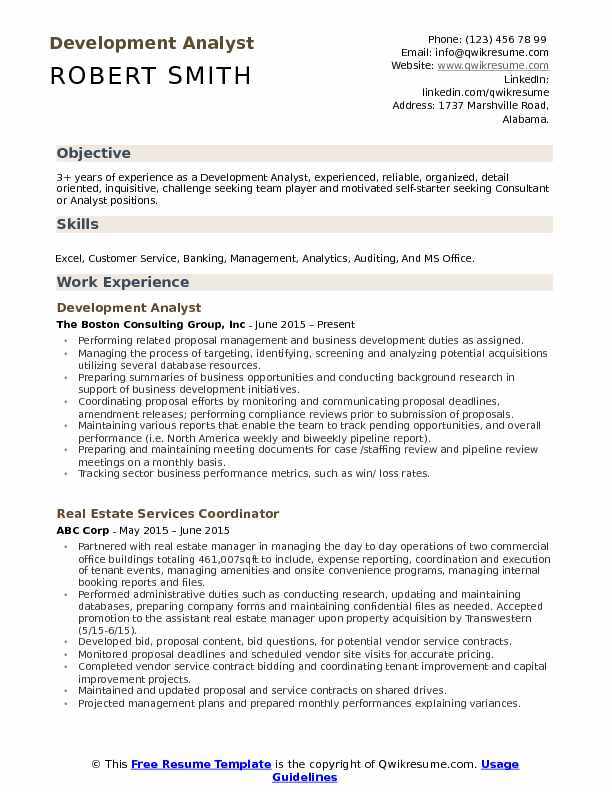 Objective : 4+ years of experience as a Development Analyst. An energetic professional in the field of operations and process management, leading teams to efficiently achieve their objectives. Seeking a position where these skills can be utilized while solving new challenges within an industry leading organization. Skills : MS Office: Excel, PowerPoint, Word, Access, Outlook, SharePoint, Project, Visio, Service Now, AS400, SalesForce, OVE, Webex, Inspex, Datagrip, AiM CRM, And QlikView. Completed the fiscal year production forecast based on historical data pulled from the database. Activate new and existing inspectors and provide access to the system to complete their inspections. Monitoring the production on a daily basis to ensure that reports are accurate then balance these metrics weekly. Serving as a key team member on the Atlanta team providing support to peers in training and development. Developing, document and maintain operational processes through Visio by creating mapping tools to outline the process flow. Making changes to data to enhance performance and accuracy based on client and business requirements. Performing complex analyses to determine process improvement opportunities, evaluate alternatives and prioritize redesign efforts. Create detailed projected plans for implementation of works streams, manage interdependencies and delivery of milestones. Provide data and reports for monitoring and decision support using SQL query development and report writing tools. Identify and compile database information in order to assist in the appropriate tracking of the daily production of field staff members.